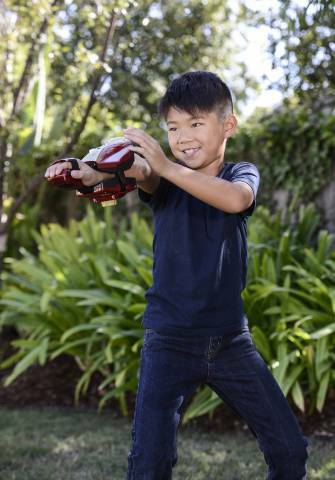 GLENDALE, Calif.--(BUSINESS WIRE)--Disney Consumer Products and Interactive Media (DCPI) and Hasbro, Inc. today launched Playmation Marvel’s Avengers – the next step in the evolution of play. The groundbreaking system of connected toys and wearables fuses technology and digital storytelling to create a completely new category of play. Hitting shelves across the U.S. and Canada for the first time today, the new toy/game hybrid aims to inspire both kids and parents to get active and creative at playtime. “This is classic play re-imagined for the tech-savvy world. It's narrative-based, imaginative play that allows kids to play as their heroes and imagine themselves in battles alongside their favorite Marvel Avengers characters. The immersive play experience is active and exciting for kids of all ages and represents a completely new category of toys,” said Jim Silver, Editor in Chief and CEO of TTPM. Along with the Starter Pack and other connected toys, fans can download and access the AvengersNet App where you can register your Avenger Gear to see progress, explore additional locations and characters, check out and test Avenger Gear upgrades, gain access to new missions and more. The AvengersNet App is available in the Apple App Store. An Android version of the app is currently in development. Offered by PowerA, families can also choose from a selection of Playmation recharging solutions and accessories now available, including: Playmation Home Base – to store your gear in between battles; Playmation Avengers Lab Gear Bag – for taking your gear on-the-go; Playmation Repulsor Recharge Pack – provides up to five hours of play on a single charge and fits securely onto the bottom of the Repulsor; and Playmation Activator Recharge Pack –fits securely onto the bottom of the Power Activator and provides up to 10 hours of play on a single charge. Hasbro (NASDAQ: HAS) is a global company committed to Creating the World's Best Play Experiences, by leveraging its beloved brands, including LITTLEST PET SHOP, MAGIC: THE GATHERING, MONOPOLY, MY LITTLE PONY, NERF, PLAY-DOH, TRANSFORMERS, and premier partner brands. 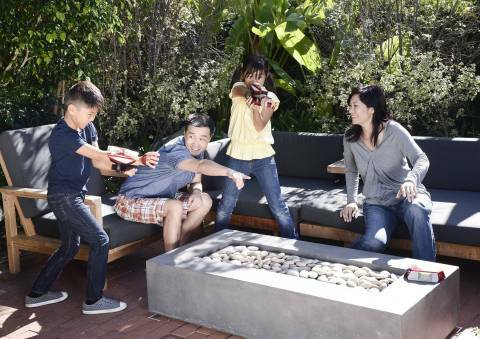 From toys and games, television programming, motion pictures, digital gaming and a comprehensive lifestyle licensing program, Hasbro fulfills the fundamental need for play and connection for children and families around the world. The Company's Hasbro Studios creates entertainment brand-driven storytelling across mediums, including television, film and more. Through the company's commitment to corporate social responsibility, including philanthropy, Hasbro is helping to build a safe and sustainable world and to positively impact the lives of millions of children and families every year. Learn more at www.hasbro.com and follow us on Twitter (@Hasbro & @HasbroNews).